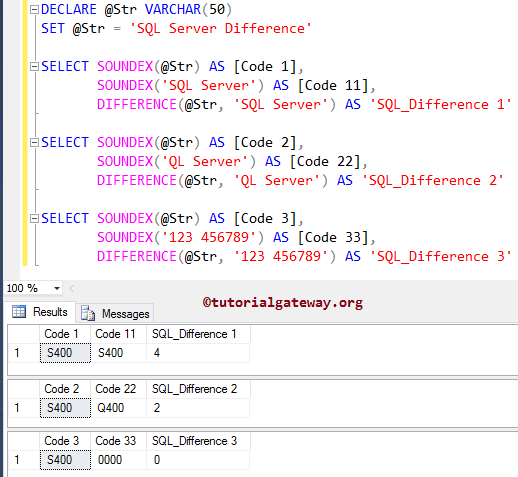 The SQL DIFFERENCE one of the String Function, which is used to return the difference between the SOUNDEX values of the user specified character expressions. In this article we will show you, How to write DIFFERENCE Function with example. Character_Expression: Please specify the valid character expression. This difference function returns an integer value ranging from 0 to 4 where 0 means No similarity, 3 means More similarity, and 4 means strong similarity or same. The DIFFERENCE Function simply finds the difference between the two character expressions. Below query will show multiple ways to use the difference function. Within this difference function example query, the below lines of code is used to declare string variable and assigning the string data. In below statement, We used this function to find the SOUNDEX difference between the variable @Str and ‘SQL Server’. 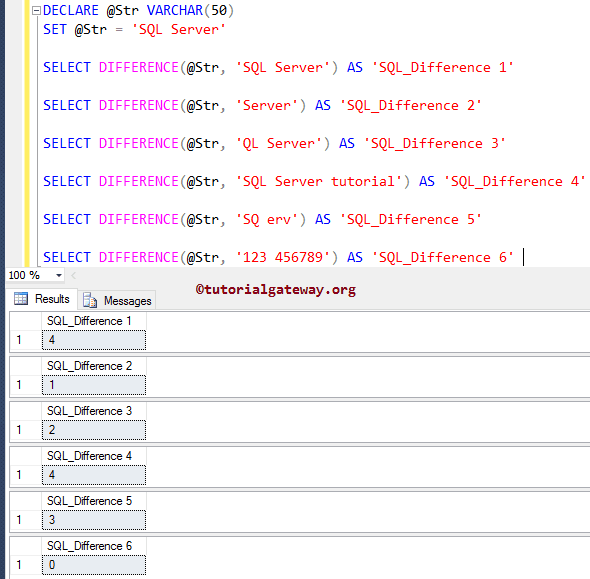 Next, we assigned new name to that result as ‘SQL_Difference’ using ALIAS Column name. The DIFFERENCE Function returns the difference between the SOUNDEX values of the two strings. In this example,We are going to return the SOUNDEX code of the character expressions along with the difference. I suggest you to refer to the SOUNDEX Function article.